With the advent of online shopping, more and more customers have found it intriguing to get personalized choices of clothing. The best part of online shopping is that you don’t require visiting any store. All you have to do is to have a proper Internet connection and check the deals and offers on the website you choose. While online shopping is intriguing for everyone, it becomes difficult to get the proper size and design of clothes for women. So when you choose kurtis online shopping, you need to keep certain tips in mind. This guide will enlighten you about the things to consider right before choosing the best kurti design to flaunt this summer. To know more keep reading on. Kurti is one such outfit which has garnered immense popularity in recent years. Not only is a kurti great for your business outfit, but choosing it would never disappoint you at a party or a wedding. 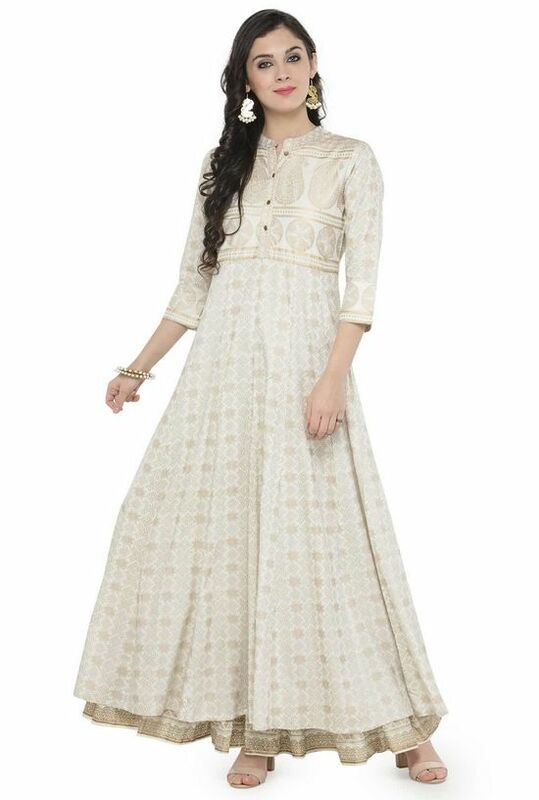 A kurti is, thus, a great outfit to flaunt on any occasion. But regardless of whatsoever occasion, buying a kurti requires keeping certain things in mind. To know more, keep reading on. As of now, everyone is aware of the variations pertaining to sizes. As a matter of fact, the sizes vary and this entirely depends on the brands. It can be safely navigated in the store by trying the clothes in the trial room. However, when it comes to online shopping, you need to choose your kurti very carefully. Unless the brand you choose uses the true fit technique, you might want to whip out the measuring tape. A kurti can be well-fitted when you know the proper size of your bust, hips, and waist. In case you’re not aware of the sizes, then here’s the safest bet. Visit a tailor and get the measurement done. This will ensure you to get the most possible accuracy pertaining to measurements. The next thing you require doing is reading the customer reviews thoroughly. You should never avoid this section, for the customer reviews happen to be the most valuable piece of information. This is due to the fact that they already know the real perspective of the kurti which you are going to buy soon. Use your screen and scan for more comments pertaining to the quality, fit, size of the material of the kurti. The kurti might look on point when you check it in the image. However, it might end up with disasters. It might be tight in the hips or bust. So reading the customer reviews is necessary when you proceed with kurtis online shopping. The feel of the kurti material is just as essential as its size. And there would be nothing worse than getting a kurti which you’ve been eyeing for days only to discover the fabric is not that great. Since it’s impossible to predict the material from a picture, it is better to familiarize with the material. Plus, you cannot even distinguish the textures properly just by looking at a picture. What you can do is open your wardrobe and find the pieces that you are fond of and check whether or not they are comfortable. You can also check whether or not they are itchy, uncomfortable, or stuffy. In this way, you can proceed effectively in buying the best kurti from the online market. In case you hate polyester, then you should always avoid this kind of material. In terms of flexibility, you should always be aware of how the color appears on the screen of your device. You can also translate the same way in person too. Color can differ from batch to batch. And you should always be prepared that the products might arrive in slightly dissimilar hue. However, if the color is not at all similar to your expectations, then you definitely have to send it back. You might encounter some occasional disappointment despite following the aforementioned things. You should always remember to familiarize and be prepared about the return policies right before the purchase. The things that you should look for are the time required to returning the product (if it’s not satisfactory). You should always keep an eye on whether or not there is an inclusion of free returns and whether or not exchanging option is available. You should also check whether or not there are restocking fees. Even if the kurti doesn’t fit properly, it doesn’t mean you should go for the return policy. You should always make sure that if it’s a bit bigger, you can always take the kurti to a tailor. This will ensure the perfect fit of the kurti, despite the inconvenience caused. Remember that you aren’t toting the garments around the store physically. So, it can bring pretty impulse purchasing while proceeding with kurtis online shopping. To avoid purchasing unnecessary things, you should always ask yourself about the purchase. In this way, you can edit your cart accordingly and find the best kurtis accordingly. Thus, this brings the closure of this guide enlightening you about the tips to choose the perfect kurti from the online market. In case you have any query, you can always visit a reliable website and check their kurti materials, sizes, and more. Awesome KURTIS. I love it.